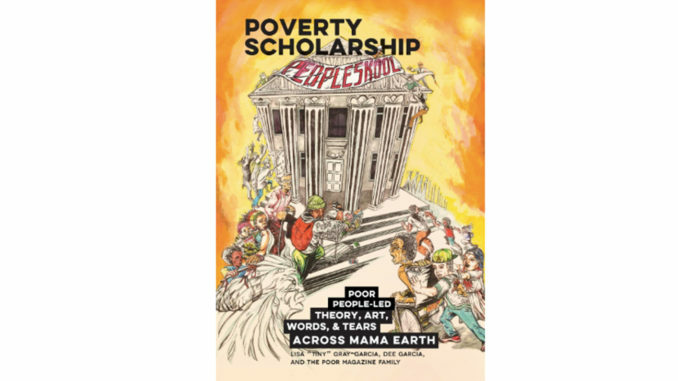 Poverty Scholarship: Poor People-Led Theory, Art, Words, and Tears Across Mama Earth by Lisa Tiny Gray-Garcia. As a professor with UC Berkeley’s Global Poverty and Practice Program, this is the book I have been waiting for, and that I want all of my students to read. I am so grateful for the effort that has gone into the writing and publishing of this essential book. In programs like the one in which I teach, we often talk about notions of “expertise” and about the need for those who experience issues most directly to be central parts of designing solutions. Too often, however, when it comes to poverty, the voices of poor people are only presented through the ventriloquism of academics, professional activists, and service providers. This book, by contrast, is an act of self-determination. This book contains deep theory regarding the origins of poverty and current homelessness crises, as well as case studies describing solutions being designed and implemented by poor people, in collaboration with those who have access to greater material means. The word “collaboration” is key here; the solutions being modeled involve horizontal approaches, not inconsequential “participation” or “input” on strategies being determined by those with more money and more power. In addition to theories and solutions, this book is also a work of art, full of creative writing, creative thinking, and descriptions of creative doing of all kinds. One of the subsections of the book actually focuses specifically on Art and Cultural Work, as this work is central to POOR Magazine. Other areas discussed include Media Production, Education, Healthcare and Social Work, Employment, Activism and Advocacy, Housing Provision and Community Reparations as an alternative to charity and philanthropy. It is easy to despair at the enormity of the problems that exist. This book, however, in its description of the work being done by the authors, is hope in action. I have also had the privilege of experiencing the teachings of POOR Magazine live, as well as visiting Homefulness, the self-determined solution to houselessness they are creating, and can say without hyperbole that the work they are doing is not only cutting-edge, it is absolutely fundamental to the kinds of personal, interpersonal, cultural, institutional and societal changes we need to make if we truly care about poverty. I cannot overemphasize how much I urge everyone to read, learn from and be moved to action by this book. If you live in or are visiting the Bay Area, I also recommend coming to meet the authors and check out the work they are doing on the ground. But I am so grateful that this book now exists so that those who are not able to come in person can still learn from the enormous wisdom, experience and expertise of these magnificent leaders. Cecilia Cissell Lucas is a faculty member at UC Berkeley, teaching in the Global Poverty and Practice Program and co-teaching a course on Art and Activism. She is also the co-founder of Creating Freedom Movements: more justice, more joy. She can be reached atcecilialucas@berkeley.edu. Next What is the significance of Friday prayers in Islam?